You may have already noticed there is growing momentum around social selling. Just a few years ago, it was considered a ‘flash in the pan’ and something that wouldn’t last very long before going out of fashion. But with more independent research from bodies such as the Aberdeen Groupwho discovered that 72.6% of salespeople using social selling as part of their sales process outperformed their sales peers and exceeded quota 23% more often and companies like IBM who attributed a 400% increase in their sales directly to a social selling pilot program, sales professionals worldwide are beginning to sit up and take notice. So what exactly are these sales professionals doing to incorporate social selling into their daily routine and make it a part of their normal workday? Here are 7 easy steps to build social selling into your day-do-day activities and help you to exceed your quota. OK, so this is not something you will do every day, but if you want to be an effective social seller you need to invest some time to ensure that your LinkedIn profile is up to scratch and is a strong representative of your professional brand. There are countless tips you can access via the web, read my recent blog for more details. Between the hours of 7am – 9am and 4pm – 6pm is the best time to share content on LinkedIn. Effective social sellers share relevant content with their network every day. If you haven’t already done so, visit Pulse, LinkedIn’s aggregated news platform, follow a few channels, influencers and publications. Pulse will push relevant news directly to your home page and you can choose which articles to share. Effective social sellers use their time effectively and know exactly who they need to talk to and how best to approach them. Using LeadBuilder you can build a search in a matter of minutes to find exactly your ideal prospect. If you’re a really savvy social seller you’ll save your search so that you get an email alert to let you know when new profiles match your search criteria. Scan through the email and see if there is anyone new in there that you should take note of to follow up on. 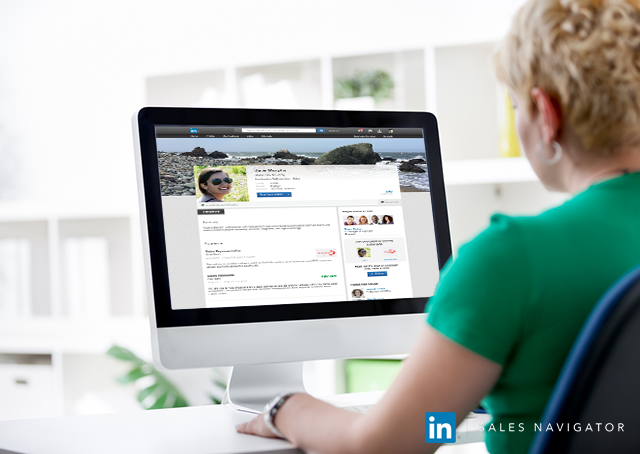 With the sales update feed on the new LinkedIn Sales Navigator, you get relevant news about your key accounts. Spend 10 – 15 minutes early in the morning checking on your most important accounts to see if there are any actionable insights. You can easily filter account insights by “job changes”, “In the news” and “connections”. Effective social sellers do a lot of research on a prospect before making any kind of contact. You should take a few minutes to read through their profile, see if you have anything in common with them (work history, college) and check “Lead Recommendations” which suggests profiles you might be interested in and who could be additional decision makers or influencers in your target company. One of our own Talent Solutions reps, Trevor Stanley, recently received an update that one of his key accounts had just hired a new HR Director. This actionable insight was exactly the kind of update that Trevor and prompted a reason to reach back out to this account. Part of building trust is firstly ensuring your profile represents you as a competent sales professional, but it takes more than a great profile to build trust. Sharing relevant information is also a key component, but what really helps is leveraging your network for warm introductions. Research conducted by Edelman Trust Barometer found 84% of B2B decisions begin with a referral. To really build trust check out How You’re Connected and Teamlink and ask a shared connection or colleague for an introduction instead of reaching out cold to a prospect. You shouldn’t ask for an introduction or send a personalized InMail and expect the magic to happen (although sometime it does). If you’ve asked for an introduction through a colleague or sent an InMail directly, it’s worth checking “Who’s Viewed Your Profile” to see if your prospect sneaked a peek at your LinkedIn profile, this can be a trigger to follow up. Once you have interacted with your potential prospect its worthwhile sending a personalized connection request. The best social sellers do their utmost to keep up-to-date with the latest news and continually learn from others. There will be more changes and improvements to the new LinkedIn Sales Navigator so I recommend visiting the Learning Center once a month to keep on top of new features and sign up for a live Webinar. It’s worthwhile signing up for LinkedIn Social Selling Blog and following thought leaders like Koka Sexton, Jill Konrath and Jill Rowley. For a full list of the top social sales people in the world check out this list by Forbes.